Are you interested in a saltwater swimming pool? At Compass Pools we have years of experience in designing and constructing high quality saltwater pools for homes across the UK. We are based in Sussex, but with contractors from Manchester and Birmingham to Scotland and Wales, we can create a pool for you no matter where you are. Saltwater swimming pools are growing in popularity because they use less chlorine and need less sanitation work than traditional pools. Contact our team today and we would be happy to go through the benefits with you. Any Compass Pool can be installed as a saltwater pool, as we can simply build it with an IntelliChlor chlorine generator. This uses regular table salt to produce chlorine in the swimming pool and the generator regulates the amount of chlorine in the pool. It also continually recycles the water ensuring it’s always fresh and hygienic to swim in. Compass Pools are ideal for saltwater as they are made using ceramic composite which will not corrode from the salt in the way that concrete pools can. You can choose from a wide variety of options including over 30 different shapes and sizes. You can have the pool of your dreams without having to compromise. Why choose a saltwater pool? There are many reasons that some pool owners prefer saltwater to fresh water. It’s a commonly held misconception that saltwater pools don’t contain any chlorine – they do, but the concentration of chlorine is much lower. Because of the lower levels of chemicals in the pool it won’t dry out your skin in the same way that highly chlorinated water can. In fresh water pools the levels of chlorine have to be very closely maintained – if there is too much in the water it can lead to burning eyes and other problems, especially if you have sensitive skin. Our saltwater pools do not have this issue as the chlorine is regulated by the generator. Additionally there are lower ongoing costs because you aren’t having to buy chemicals. Some also maintain that saltwater is much better for your skin as it can help to exfoliate. One common issue with saltwater pools is no problem for Compass Pools. This is that saltwater can corrode concrete, so if your pool has a concrete base and the water is able to reach it, there can be serious issues with corrosion. 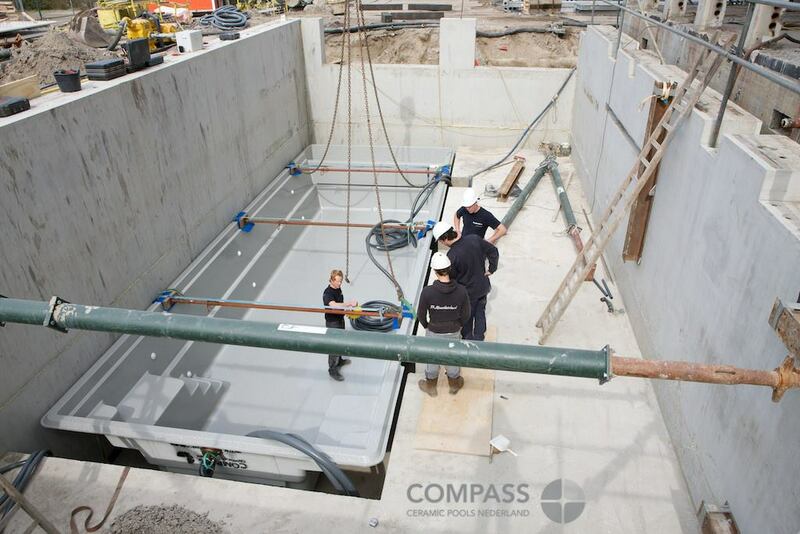 Compass Pools are one-piece ceramic pools with no concrete so they will not corrode in the same way. At Compass Pools we will upgrade our stainless steel fittings to marine grade 316 stainless steel if you wish to have a saltwater swimming pool.